Well, I must have a short attention span today. Up next on the blog, an episode of that great little syndicated dramatic filler program, "Five Minute Mysteries". Program 28 is "The Tell Tale Knife" and concerns murder on a southern plantation. The show was transferred from an original RCA Syndicated Program vinyl transcription, matrix number ND5-MM-3244-7. Now another edition of "Short Attention Span Theater", otr-style. 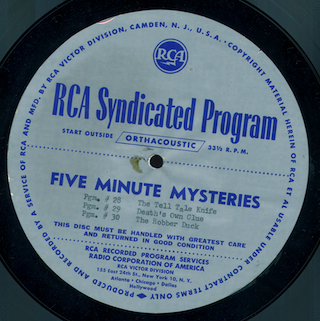 It's the popular RCA Syndicated Program series, "Five Minute Mysteries". Program 27 is "A Bit of Logic" and was transferred from an original RCA vinyl transcription, matrix number ND5-MM-3329-8B. The disc is dated December 22, 1947 and the disc is probably a repressing. Let's pause for a brief mystery. A five-minute mystery, in fact. From the RCA syndicated series, here's program 26, "A Rose By Any Other Name". The show was transferred from original RCA Syndicated Program vinyl transcription, matrix number ND5-MM-3229-8B. The disc is dated December 22, 1947 in the matrix, probably indicated a repressing - the "ND5" in the matrix number would put the original mastering of the show in 1945 so this is probably a repressing. "Five Minute Mysteries" was a wonderful little show syndicated by NBC in the 1940s, used by stations as "filler" after sports broadcasts or to fill a short slot on their schedule. There are several episodes of the program floating around but I'm not sure the entire series has been found. Program 25 is titled "Signal Block" and was transferred from original RCA Syndicated Program vinyl transcription, matrix number ND5-MM-3229-8B. The disc is dated December 22, 1947 in the matrix. I'll drop in more of these in the coming months on the blog - I have two discs from the series.